At Arden Fields School our vision is that each child thrives in a safe, stimulating environment where they develop a love of learning that enables them to ‘Achieve and Flourish’. Arden Fields School aims to deliver a curriculum that inspires and challenges all our pupils, staff and parents. Successful learners who enjoy learning; make at least good progress and achieve. Takes into account individual needs and learning styles. At Arden Fields all pupils have an EHCP which identifies them as having additional Social Emotional and Mental Health needs. Our admission critieria outlines that we expect all our pupils to have the potential to reach at least reach age related expectations in learning. Our goal is for all our pupils to develop holistically, ensuring progress in both academic learning and in managing their own emotional needs. At Arden Fields it is every pupil’s basic entitlement to access learning and therapies with specialist staff, in small groups and with access to one to one support too. At Arden Fields, everything we do with pupils is based upon strong relationships and a sound understanding of the impact of early attachment and experiences of trauma. 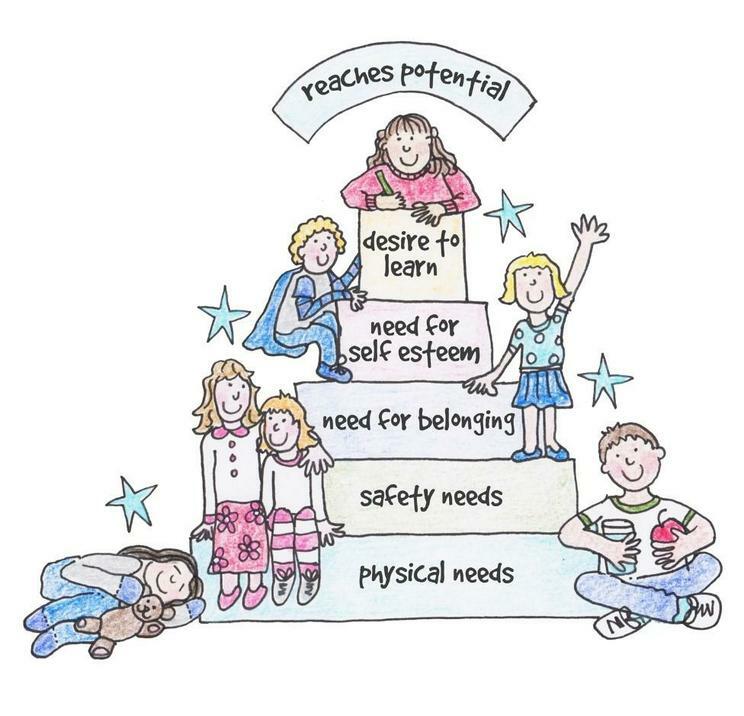 We ensure that ‘Maslow’s Hierachy of Need’ is central to our approach with all pupils. The National Curriculum that provides both academic rigour and enrichment through visits, visitors and focus days. Theraputic provision, personalised to their individual needs with the outcome of removing barriers to learning. Teaching and learning that takes into account different learning styles and personalisation for pupils. The Arts, to develop skills, interests and confidence. Physical activities, to develop co-ordination and teamwork as well as promote a healthy lifestyle. Off-site visits, activities and residential visits, to develop pupil’s social interactions, independence, self-reliance, confidence and skills for the future. Extra-curricular activities during lunchtime and after school such as art, i-pads, music and sports, to develop their interests. Our curriculum is developmental, ensuring prior learning is reinforced and new learning increases in cognitive complexity and greater depth. Pupils will see the same topics throughout their learning journey, with each encounter increasing in complexity and reinforcing previous learning. We recognise that our pupils arrive with gaps in their learning which impact on their ability to develop new skills and knowledge. Our school systems aim to identify these gaps promptly and teachers then plan carefully to address these learning gaps, at the same time as building pupil confidence in learning. The National Curriculum is used to plan, teach and assess pupils in Key Stage 2, in all subjects. Pupils are taught throughout the week by their class teacher in individual lessons for English, Maths, Science, Computing, RE, Music, PE and French. Pupils are taught History, Geography, Art and Design & Technology through engaging termly learning themes. Learning themes empower staff to ensure that skills can be taught in the most creative, current and relevant contexts for pupils and can be led by the cohorts’ interests and needs. We operate a two year Key Stage 3, delivering a broad and balanced curriculum which will be clearly mapped to the National Curriculum. In Year 7 and 8 we maintain a primary learning model to ensure strong attachments are made to key adults over time. Year 9 will provide a clear transition into both GCSE and a secondary model of specialist teachers. We believe that the essential work around attachment and relationships within Years 7 and 8 will enable pupils to approach Year 9 and the start of their accredited learning with positivity. Pupils’ are taught English, Maths, Science, Computing, RE, Music, PE, French through individual lessons. History, Geography, Art, Design & Technology are delivered through a Learning Themes focus. We will operate a three year Key Stage 4. This is longer than in many secondary schools and really does reflect our understanding and recognition of the importance of transition for our pupils and their specific needs, alongside our determination for our pupils to take their learning as far as they can prior to taking their exams. We ensure pupils access enrichment days every half term to ensure breadth of experience in contrast to a narrowing curriculum. Pupils will access a core offer of working towards accreditations in Maths, English Language, English Literature, Science (Double Award), Computing. Computing is part of our core offer in recognition of our pupils’ interests and strengths. Our core offer also includes RE, PE, Careers and PSHCE. Pupils chose options from accreditation in either: Humanities (or single award History and Geography for those pupils who intend to complete the English Baccalaureate,) Art, Food Technology and PE. It is our aspiration that pupils attain GCSE’s although pathways to alternative accreditations are available for pupils who require this personalisation. For more information on Curriculum Design, specifically implementation and impact please see our Curriculum Design Policy.